↑ 1.0 1.1 1.2 1.3 "Polio vaccines: WHO position paper, January 2014" (PDF). Wkly Epidemiol Rec. 89 (9): 73–92. Feb 28, 2014. PMID 24707513. ↑ "Poliomyelitis: Fact sheet N°114". World Health Organization. Oct 2015. สืบค้นเมื่อ 14 Dec 2015. ↑ "WHO Model List of EssentialMedicines" (PDF). World Health Organization. October 2013. สืบค้นเมื่อ 22 April 2014. ↑ "Vaccine, Polio". International Drug Price Indicator Guide. สืบค้นเมื่อ 6 December 2015. ↑ Shimizu H, Thorley B, Paladin FJ, และคณะ (December 2004). "Circulation of Type 1 Vaccine-Derived Poliovirus in the Philippines in 2001". J. Virol. 78 (24): 13512–21. doi:10.1128/JVI.78.24.13512-13521.2004. PMC 533948. PMID 15564462. ↑ Cono J, Alexander LN (2002). "Chapter 10: Poliomyelitis" (PDF). Vaccine-Preventable Disease Surveillance Manual (3rd ed.). Archived from the original (PDF) on 2011-10-22. 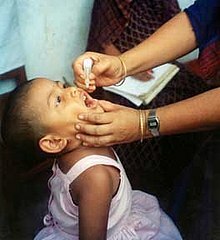 ↑ "What is vaccine-derived polio?". Online Q&A – WHO. October 2014. Archived from the original on 7 September 2015. สืบค้นเมื่อ 6 September 2015. ↑ Kew O, และคณะ (2002). "Outbreak of poliomyelitis in Hispaniola associated with circulating type 1 vaccine-derived poliovirus". Science. 296 (5566): 356–9. doi:10.1126/science.1068284. PMID 11896235. ↑ Yang CF, Naguib T, Yang SJ, และคณะ (August 2003). "Circulation of Endemic Type 2 Vaccine-Derived Poliovirus in Egypt from 1983 to 1993". J. Virol. 77 (15): 8366–77. doi:10.1128/JVI.77.15.8366-8377.2003. PMC 165252. PMID 12857906. หน้านี้แก้ไขล่าสุดเมื่อวันที่ 8 ธันวาคม 2560 เวลา 15:14 น.